Carving Detail, Banteay Srei, Siem Reap. One of the reasons BB visited Cambodia this Christmas (beyond our love of new adventures) is that the country is not the most popular luxury destination. There is a heightened cultural awareness of the country at the moment, true – but it is mostly in respect of it’s recent, tragic past. Historically the Khmer were once a powerful and prosperous people; today their nation ranks 146 out of 189 countries on the UN’s Human Development Index. It only skims above troubled Myanmar, teetering at the bottom of the ‘Medium Human Development’ array. The country has made great strides towards recovery, but still presents a dramatic contrast to its far more popular neighbour Vietnam. Indeed, wedged between several of the world’s fastest growing economies, in some respects Cambodia has lost out from globalisation. All too often during our stay, we saw Cambodians reap the whirlwind of modernisation while planting scant seeds of their own. Yet BB would still give a caveated recommendation to our readers. Just understand that the luxury experience is somewhat different in a place which only left behind its status of Low Human Development a few years ago. We generally found that the Khmer themselves could bring out the best in their country: polite, friendly, diligent (if not always up to our high expectations), dependable (if not always honest), and hospitable to a fault. For Western visitors the formalities may seem antiquated, and at times overbearing, but they almost never felt perfunctory. To be sure, a week and a half round trip can only provide a surface reading: but what we saw was both uncertainty and promise. 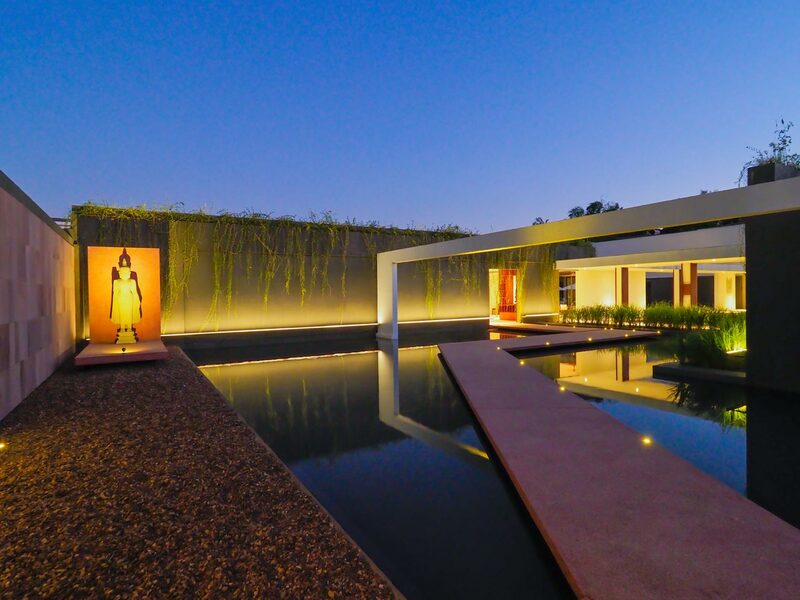 At least for the high-end luxury market, Cambodia might remain a less explored – and underrated – travel destination. The krama is a long, chequered scarf, sometimes ornamented with tassels, more notable for its ubiquity than any unique characteristics. It is also indispensable, we soon discovered, as a palliative for both intense sunlight and heavily concentrated, airborne particulates in and around urban areas. Bring an equivalent article or acquire one as quickly as possible. Sunglasses are likewise essential. Covered shoes are more optional. Colleagues abandoned their flip-flops from the same night we arrived, as they are totally unsuitable for traversing patchily maintained sidewalks or dashing across roads. Strapped sandals with adequate support versus shoes comes down to personal preference, and the acceptable level of dust and dirt on your feet. Whether its clothes or footwear, suitability and quality pays for itself in both money and time searching for replacement gear. Prices can be expensive, and options limited, especially when you require something immediately. Transportation links are underdeveloped, and renting your own car is a non-starter. Phonm Penh is compact enough to walk through the city centre, but otherwise expect to spend a lot of time travelling by remorque, tuk-tuk and rarely car. Grab/PassApp, the regional equivalents for Uber, are highly valuable for their reliability, transparent pricing, and card payment capabilities. For long distance travel, it’s best to ask your hotel make arrangements. Information on either rates or even operators is difficult to acquire, and our independent efforts to save money mostly resulted in wasted time – or worse. In hindsight this should have been obvious, but anyone who makes a living by tuk-tuk/remorque most likely doesn’t own a car – so don’t ask them to transport you across the country in one. 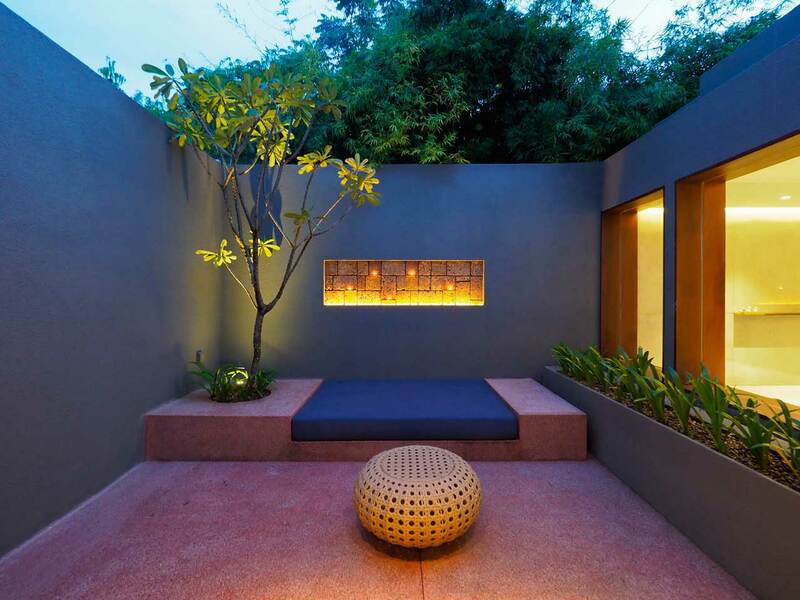 If you’re staying in the city centre during your visit, we advise making Wat Botum your base. Most of our recommendations for things to do/see in Phnom Penh are within walking distance – if you can bear the heat and humidity – or a short tuk-tuk drive of this little park. It is no coincidence that this area is the most lively, day and night. 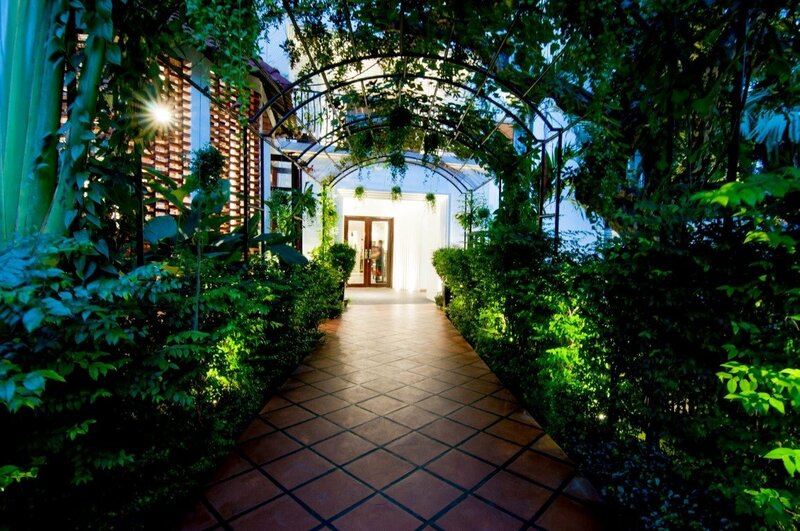 Best of all, one of Phnom Penh’s best hotels (see below) is conveniently located down a quiet, leafy side street. Sightseeing in Phnom Penh can be a frustrating experience, thanks to the limited opening hours at the more popular attractions. Fortunately, many of the more popular attractions – i.e. the temples and museums – are clustered in the centre of town. The Royal Palace was a highlight of the entire trip, despite a truncated visit amid the usual overflow of fellow travellers. A rare example of a living, working, palace in this part of Asia, the complex of reception halls, thrones rooms, mausoleums and elephant stables are imposing and grandiose. It is worth exploring for both the architecture and the object collections, the latter opulent and fascinating if crudely curated. Tour guides are somewhat expensive, but they can be a treasure trove of site and cultural information if you are prepared to ask plenty of questions. At the other end of the social spectrum, the national television centre hosts Kun Khmer (traditional Cambodian kickboxing) matches every week. Ascertaining the schedule is difficult, due to a lack of online information, and we relied on our hotel to make enquiries. Despite being televised events, the fights are freely open and the vast majority of the crowd will be local labourers. A note of caution: the television centre is located on the industrial outskirts of town with no public transport and sparse WiFi. Unless you’re staying at the Balé (see below), there is a risk of getting stranded out here if you don’t ask your driver to stick around. On a sombre note, Tuol Sleng is an utterly heartbreaking memorial to the genocide. Originally a school, the Khmer Rouge used it as one of its country-wide detention centres for enemies of the state (which, from the very beginning, encompassed vast swathes of urban society). Today the wide, well-tended gardens belie the atrocities that were perpetrated here, laid bare through artefacts, reconstruction and meticulous documentation. Both the Central Market and the Russian Market offer similar, mass-market tat. 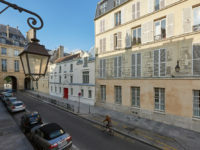 Between the two, I would recommend the former – and only because the French colonial building offers an airy sojourn from the oppressive heat and fumes outside. The sole meaningful difference between the markets here and, say, Saigon, is that the vendors are generally more placid and polite. A personal recommendation: Amboh Espadrilles, secluded within white-washed, leafy Abdul Carime Street, is a must for anyone who wears the eponymous shoe. 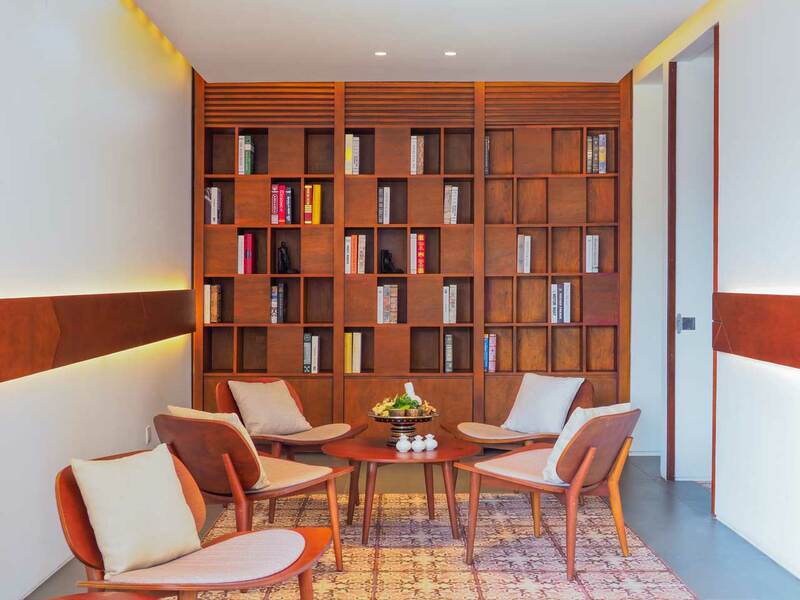 Sourcing fabrics from Cambodian weavers, one can customise from a myriad of patterns and panelling, and the shoes are handmade at the on-site workshop. The results was a pair of ethical, superior quality shoes, and a truly unique souvenir. 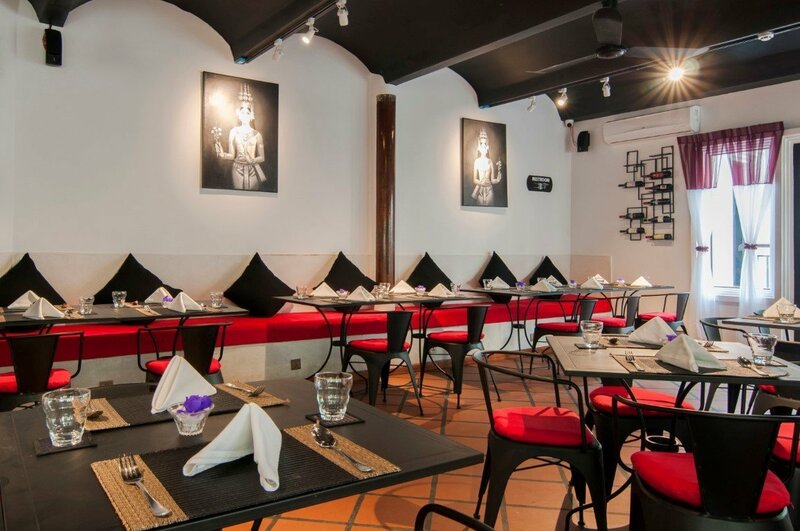 Malis, just a few minutes’ walk away from Wat Botum, combines classic dishes of Cambodia with a European al fresco dining (and prices). 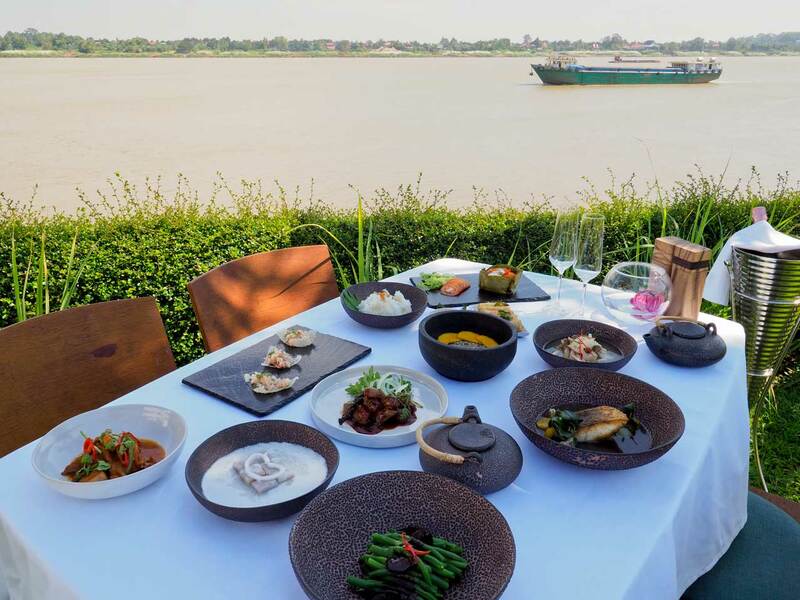 Particular standouts include the Prahok Ktis, a tricky dish of fermented pork mince and rice; the ubiquitous Fish Amok, a mild curry wrapped in leaves; and a selection of creme brulees with a Khmer twist. 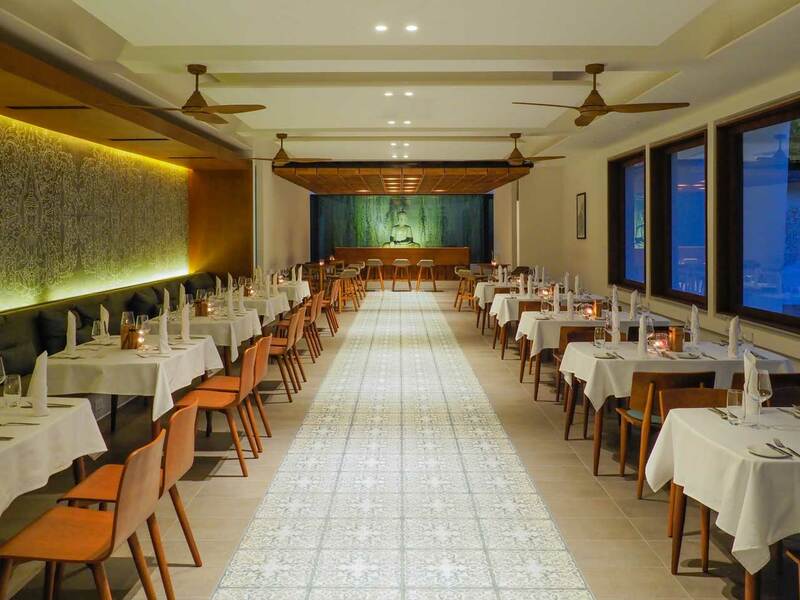 Unmatched flavours, the relaxed vibe and a charming music selection easily made this our finest dining experience in Phnom Penh, if not Cambodia. Sovana is a popular bar/grill with tourists, expats and locals, with two separate locations conveniently positioned off of the hectic Wat Botum. Every night groups of businessmen are regularly bussed in, due perhaps to both the food and a hostess uniform that is the Cambodian equivalent to Hooters. To be clear the atmosphere is trendy, not sleazy, and the reasonably priced menu straightforward but colourful. Sadly the grilled bees were unavailable to sample, but the frogs’ legs were easily the best we had on the entire trip. This is as close to good, authentic street food as we found in a sit-down setting. 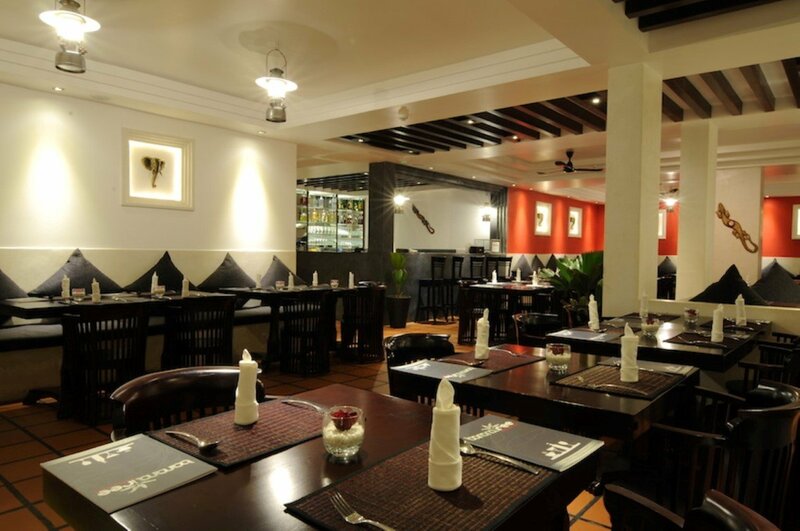 Ngon offers primarily Vietnamese cuisine – equal to anything we found in Vietnam itself. 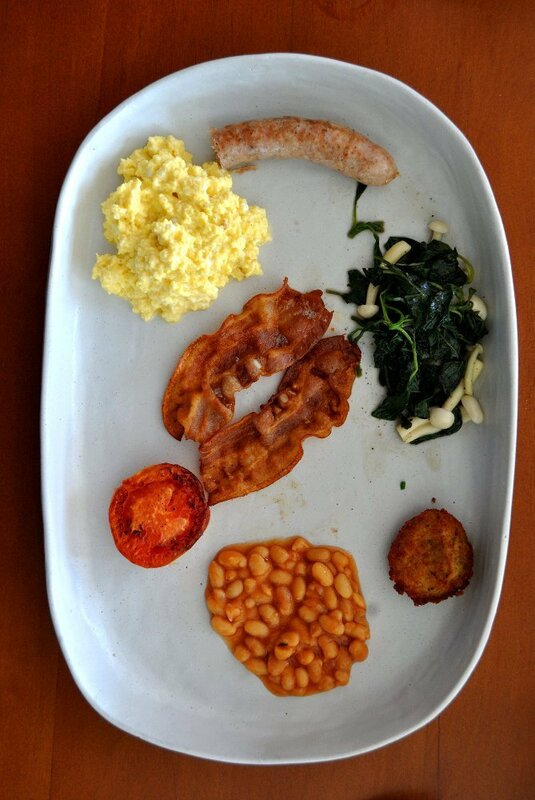 It’s leafy, open air front on the south side of Wat Botum makes for a perfect brunch venue. The food is hearty and filling (at least the few things we randomly selected) but it is essential to order a fresh, ice cold lhassi served in a generously full jug. I thoroughly enjoyed and would recommend both the smoked ‘snakefish’ (eel?) congee and the soursop lhassi (mild and refreshing and not at all sour). It’s true what they say: first impressions are the most important. At La Rose Suites, the sweet-smelling rose scent you are greeted with upon arrival is reinforced by staff offering you a rose-scented wet towel to cleanse your hands. Bliss incarnate! 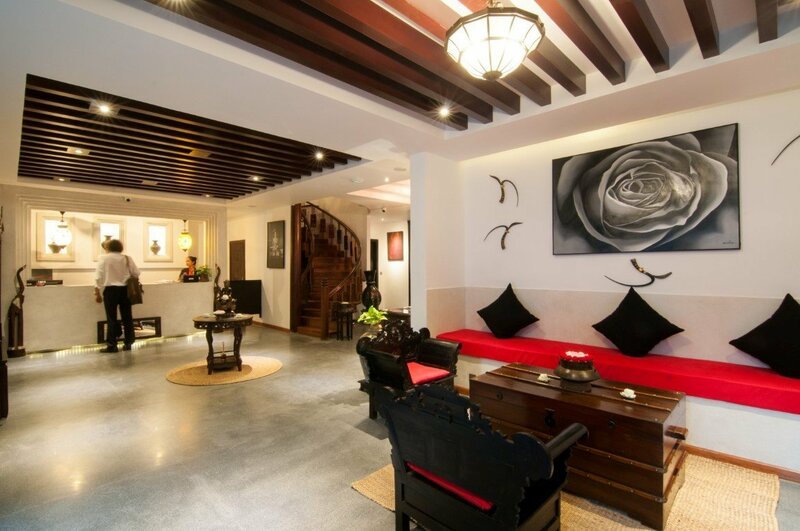 La Rose Suites is a few strides away from the Independence Monument and Wat Botum Park, and a little further from the gentrified expat quarter of Phnom Penh. Its central location provides ease of transport and access, as well as myriad shopping and dining experiences at your fingertips. 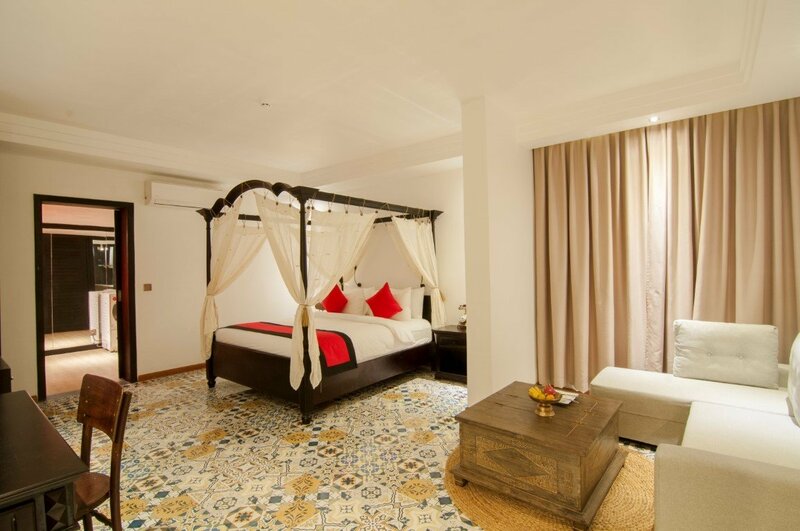 The hotel is adorned in a traditional Cambodian style: think large wooden beds and deep stone tubs! We loved the generous size of the rooms as well as their tasteful furnishings. One room in particular had a vast separate kitchen and eating room – the perfect home away from home comfort and ideal for visitors struggling to adjust to local cuisine. That said, the hotel has a fantastic restaurant – Banana Tree – that offers local Khmer cuisine as well as Western dishes for the less adventurous. Notable dishes include the fish amok and loc lac – two famous Khmer dishes that the Banana Tree restaurant has perfected. 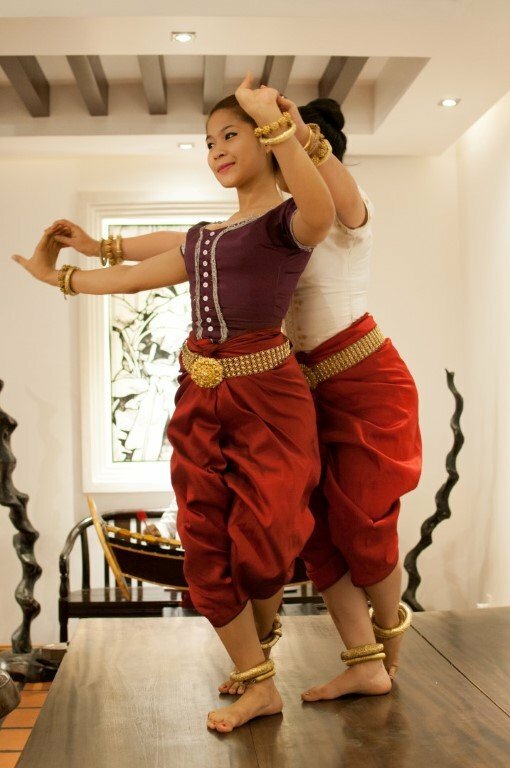 All of this while enjoying the beautiful and elegant Apsara performance that is on every night. Yet La Rose Suites’s best assett is its team, always warm with their welcomes and eager to please, led by the superlative GM Manny Yang. Greeting each and every guest who arrives, all through our stay Mr. Yang was never anything other than gracious, polite and an intelligent conversationalist. He is also a strong believer in the social outreach programme, which provides training and employment opportunities for young people. 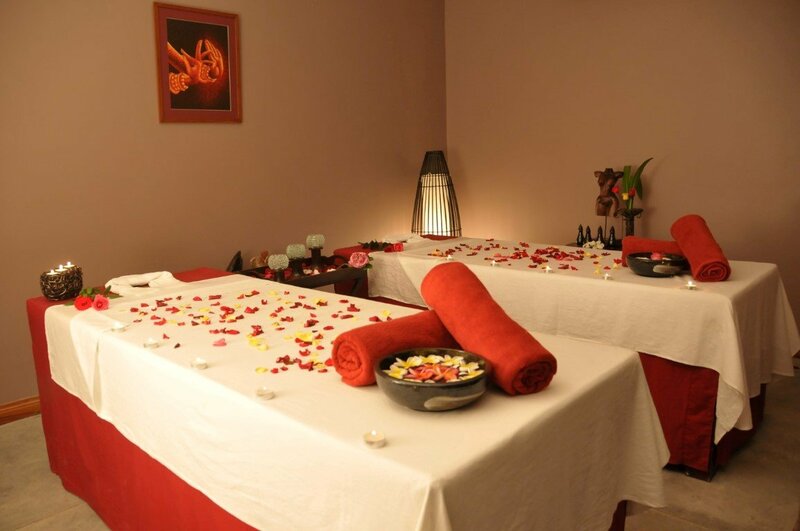 Last but not least, the spa experience at La Rose Suites is one you should not miss out on. 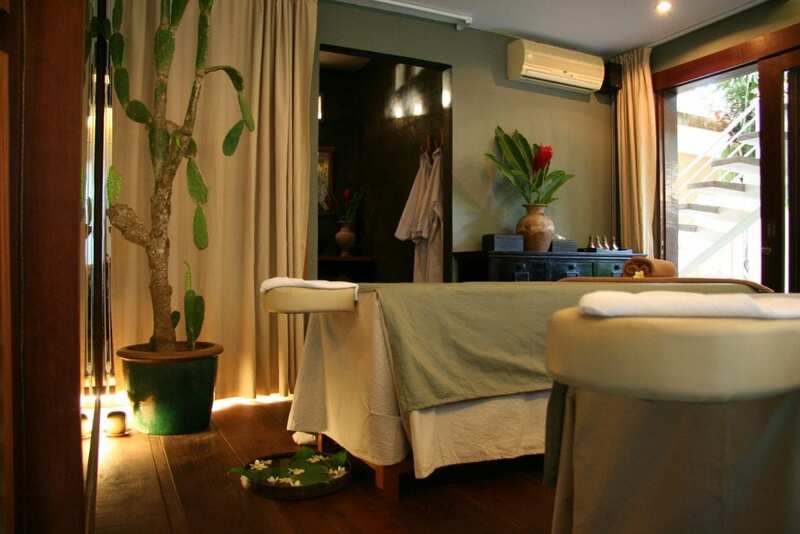 With treatments such as the tantalising rose massage or the traditional Khmer message, as well as numerous scrubs, bath treatments and other rituals, the spa menu is comprehensive and the masseurs some of the best we have come across. 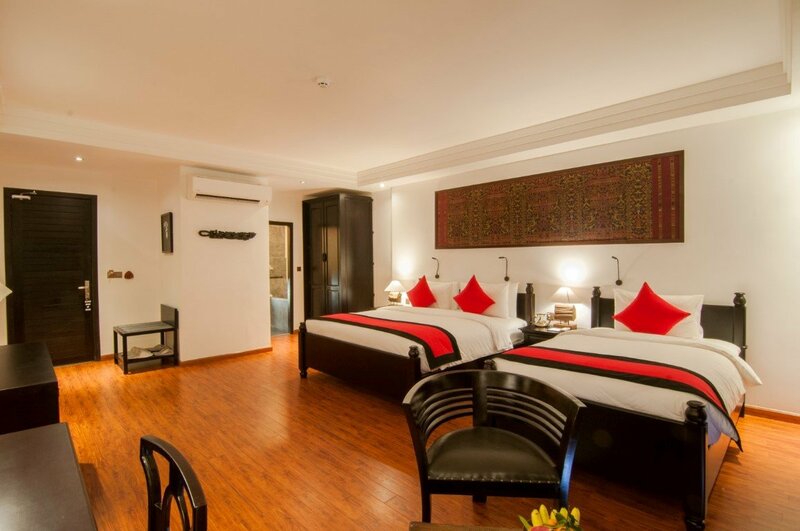 The Balé is an all-encompassing retreat and haven from the bustle of Phnom Penh. 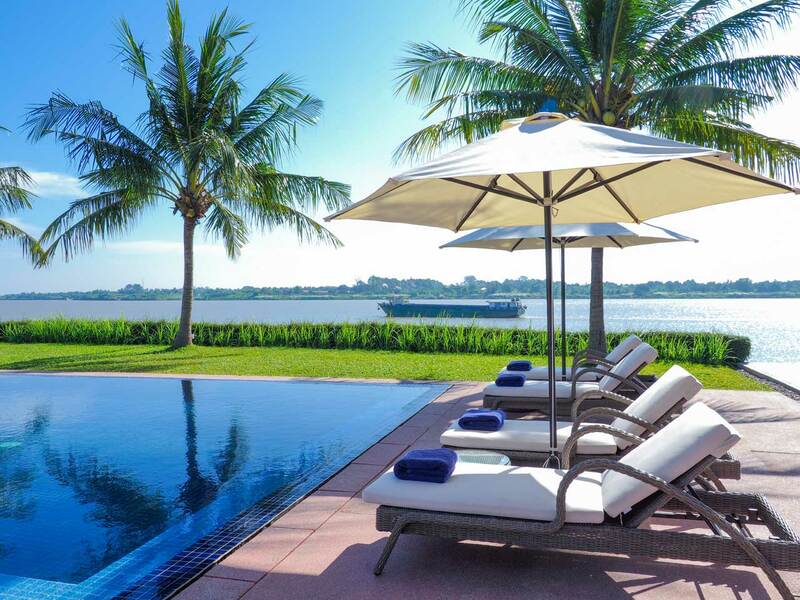 The hotel occupies a prime position overlooking the Mekong River and one of its major attractions is the long and wide pool with unrivalled and unmarred views over the river. 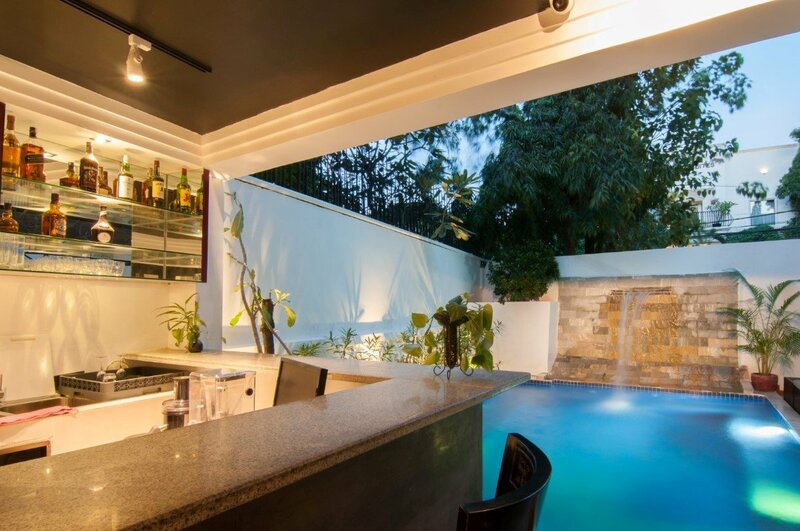 Sitting by the pool and sipping on a cocktail can, in fact, be one of the highlights of your day and a respite to the loud and overwhelming city centre. 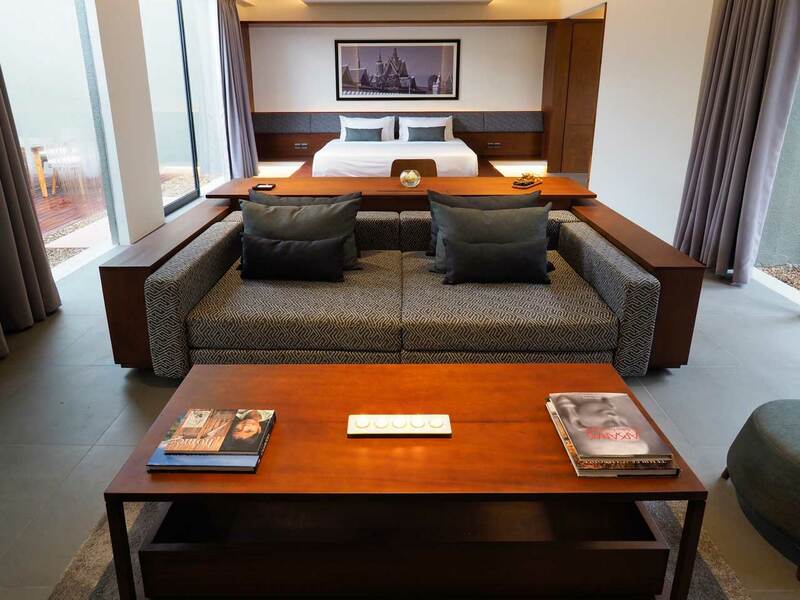 The rooms are ultra large studios featuring a plush bed with an abundance of super soft pillows. The large stone bathrooms feature a sink-in tub and rain shower, along with toiletries provided by the hotel. We loved the white and grey minimalist theme of the rooms which is spiced up with a unique wall fresco, courtesy of K-Bach gallery in residency. The highlight of The Balé, in our opinion, and one that separates it from other hotels in Phnom Penh, is the quality of the food. Breakfast consisted of myriad fresh fruit juices (green health juices and indulgent smoothies), as well as an a la carte Khmer breakfast featuring Khmer-style full english and local dishes such as Kuy Teav (noodles in a pork broth) and Lort Char (stir-fried noodles with wagyu beef). The Balé was, hands down, one of the best hotels we stayed in on our trip and we look forward to visiting again, especially when their 007 style speedboat arrives. Progressing the road south from Phnom Penh was, to be frank, to witness the miserable price of progress. Leaving behind the dusty, but otherwise ordered, outskirts of the capital, the road descends into disarray as whole sections are continuously built and rebuilt. Almost everywhere there are piles of trash clogging pavements, verges, waterways and fields. This highway is the lifeblood of Cambodian towns, and we saw people that will live and work upon a quagmire of mud, rubble and rubbish. Further on the highway seemed to disintegrate, leaving potholes for ground and an impenetrable storm of dust. Mercifully this punishment subsides as the road returns, close to the environs of Kampot. Whatever the criteria used to evaluate food and lodging, the online ratings are vastly inflated. Our supposedly four star hotel was actually a collection of cramped, boxy rooms abutting a swamp buzzing with mosquitoes. In the evening the dust cleared, the bridge glows with pretty and multicoloured lights, and there is a semblance of respectable nightlife along the colonial waterfront. Our restaurant experience, at one of the highest rated establishments, was blandly inoffensive. Yet this umbral transformation was superficial. The waterfront is a scene of decrepitude, even as something new and indigenous springs up around it. Walking along the riverside, mostly alone, we saw not a few rats scurrying among the cracked and broken paving stones. Even a ripe stench of effluent wafted through the balmy air, far worse than anywhere we went in Phnom Penh. A small but vibrant community of backpackers and adventure travellers takes advantage of the town’s proximity to several national parks. A couple of our group joined a motorcycle tour to Bokor Mountain, organised by Mad Monkey Hostels. That trip alone revised their opinion of Kampot entirely, although they report that the dramatic views are somewhat spoiled by encroaching development. There are also efforts to revitalise the pepper farms, supposedly renowned among chefs the world over prior to the Khmer Rouge period. At least one has a boutique shop and cafe in town, targeting the fair trade, environmentally conscious crowd. Multiple farms are open for tours, also by motorcycle (the road is too poor for tuk-tuks). With some serious investment, Kampot could extend this ethos with dedicated conservation programs and take advantage of the region’s surviving history and natural landscape. Unfortunately the area is poised for a takeover by the Chinese middle market, and Kampot will likely become a dedicated tourist processing hub. Already there is an extravagant hotel with a new, concrete road (signposted exclusively in Mandarin), running straight through Bokor National Park. Exiting Kampot southward made for a genuinely pleasant drive, this time by tuk-tuk. A cool breeze alleviated both the midday heat and the concentration of red dust in the air, rapidly dissipating as we drew further away from the town. There was a complete dearth of traffic on the narrow motorway, which remained crisp and smooth. Our vehicle (unthinkable from Phnom Penh to Kampot) and the environs gave every impression of a picturesque country ride. The open plains gradually rise and the hills hem closer and closer. Eventually we found ourselves skirting the flat and unassuming shoreline. The interior becomes dense with old forest, climbing the rolling slopes into a chain of tall, gentle hills. This landscape is little more arresting than, say, the South Downs of Sussex, but the streets of Phnom Penh felt a world away. 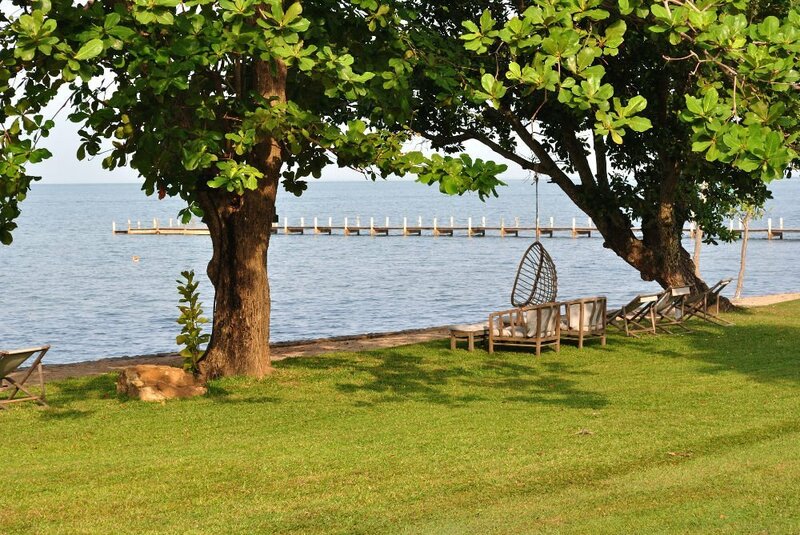 Unspoilt landscapes, clean air, and a temperate climate: Kep is the quintessential seaside retreat of Cambodia, popular with locals and tourists alike. On land, sightseeing tend to be either historical (cave shrines), environmental or anthropological. 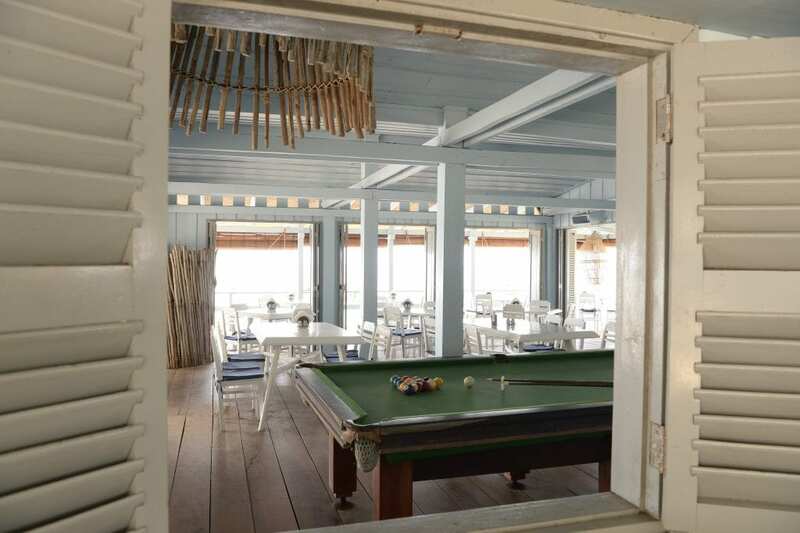 The atmosphere is familial and communal, both during the languid days and the merrymaking nights. In some ways I was reminded of Liguria in miniature – right down to the (few) sailing yachts, a sight I would not have expected in Cambodia at this point. 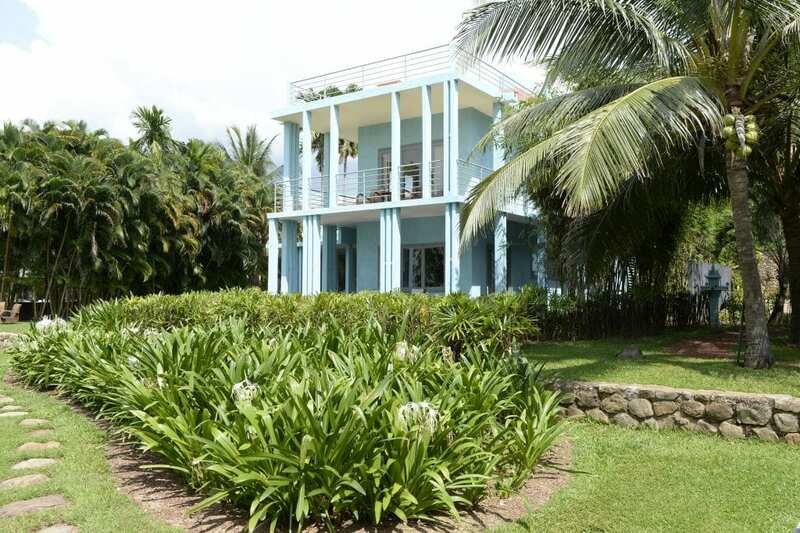 The starkest difference is that the French colonial estates lie in ruins, the burnt out buildings and stone walls disappearing into the vegetation. 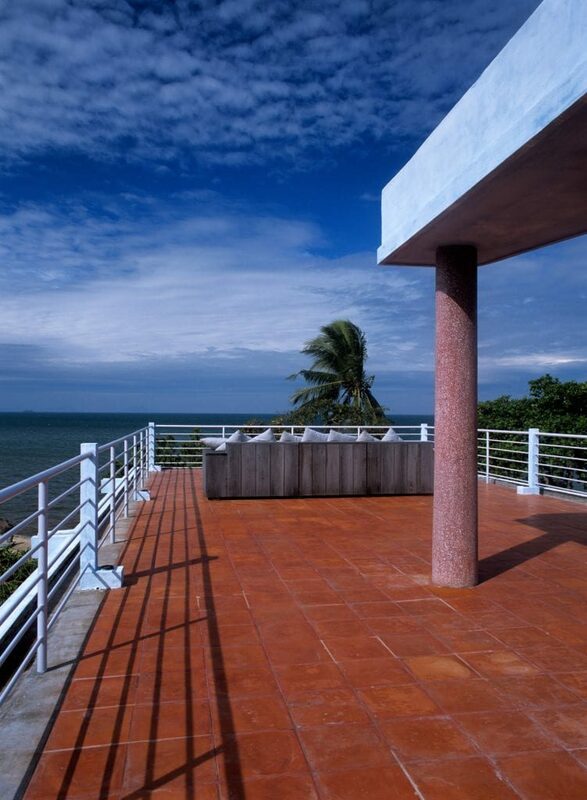 Sadly, Kep’s limited development is a consequence of real estate speculation rather than environmental concerns. These estates apparently languish in the hands of emigre families, artificially inflating the price of land out of the reach of locals. We visited one fishing community, subsisting in single-room huts piled over the water, while the land behind remained green and barely touched. Even these homes are technically squatting, and are liable to be cleared once serious investment arrives in the region. The plastic cleanup belies what’s going on beneath the surface, as fishermen use line nets to indiscriminately scoop up marine biomass. Regulation is lax, and even the handful of policemen have their own boats just to make ends meet. Despite its remoteness, Kep is experiencing the same collapse in marine stocks (and consequent loss of jobs) as much as elsewhere in the world. Knai Bang Chatt’s Sailing Club (Photograph: Knai Bang Chatt). 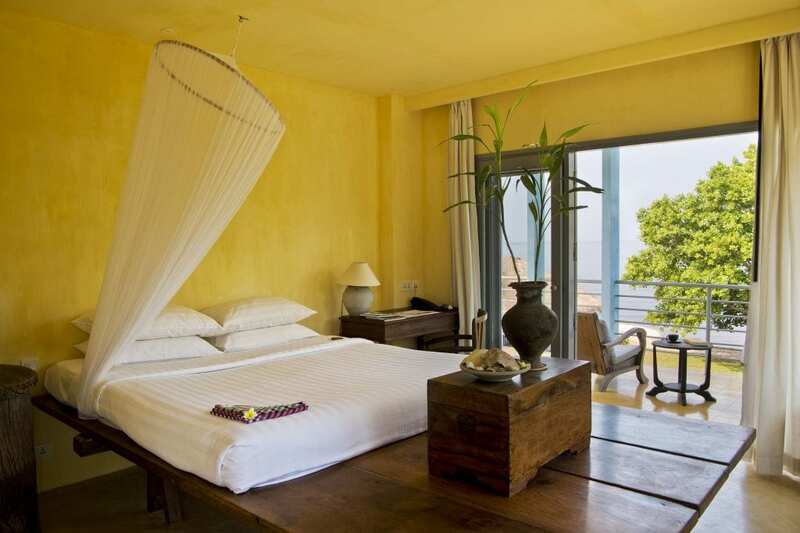 During your stay at Knai Bang Chatt (where else? 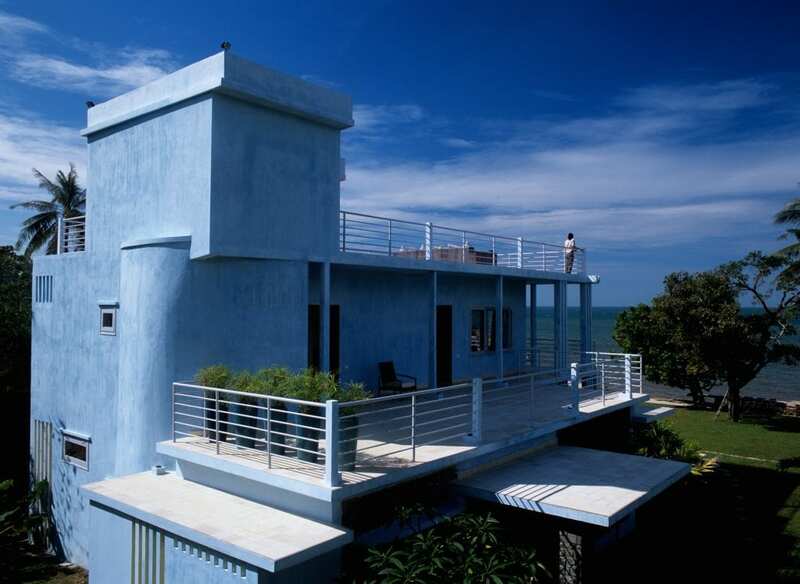 ), you may very well come across Jeff Moons, secluded and exclusive as this place is. The charming Belgian may very well regale you with his (thoroughly fascinating) life story and the founding of the seaside resort and sailing club. The key moment for Jeff was when, atop Angkor Wat, he witnessed the Knai Bang Chatt: a scintillating aura circling the sun, also represented as the Buddha’s personal halo. 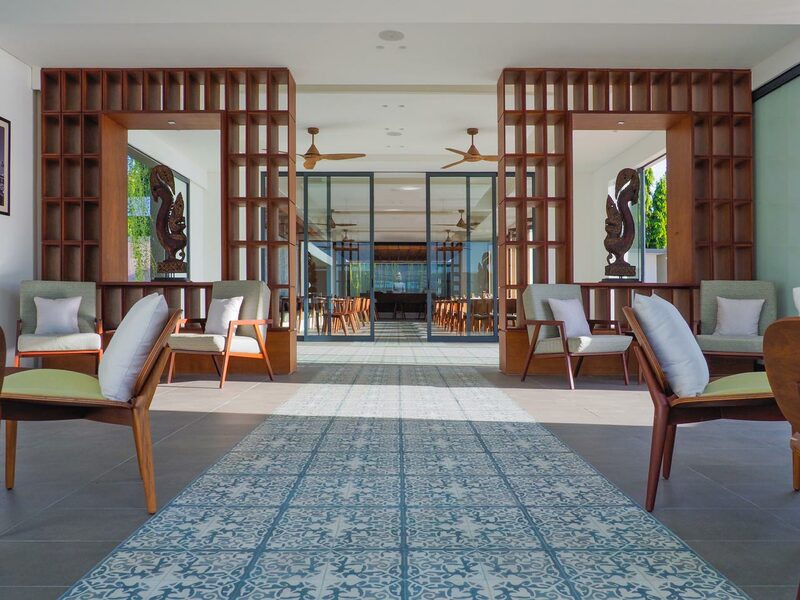 This, and more earthly incidents while exploring Cambodia, go far to explain the resort’s ambitious, totalising approach to sustainable and transformative luxury. 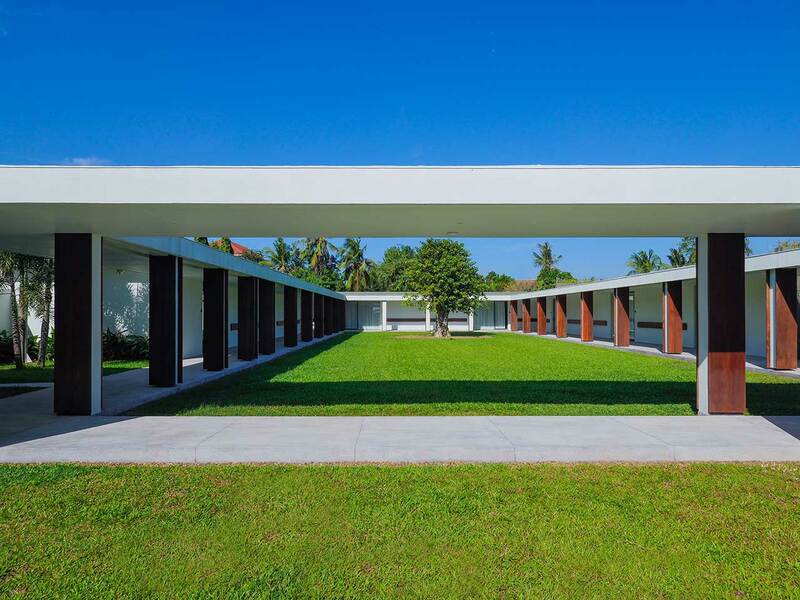 Knai Bang Chatt’s original buildings were built between 1962 and 1965 by protégés of Vann Molyvann, the renowned Khmer pupil of Le Corbusier. 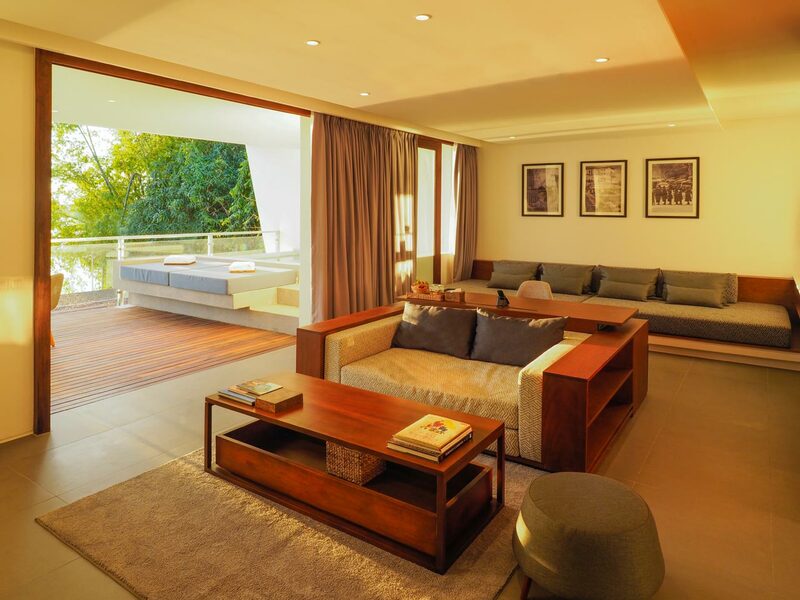 The initial owners purchased the three buildings in 2006 and, after joining forces with French architect Francoise Lavielle, restored the villas (plus a new one) to their former glory, adding a contemporary twist in 2012 by adding a fifth villa to the complex. 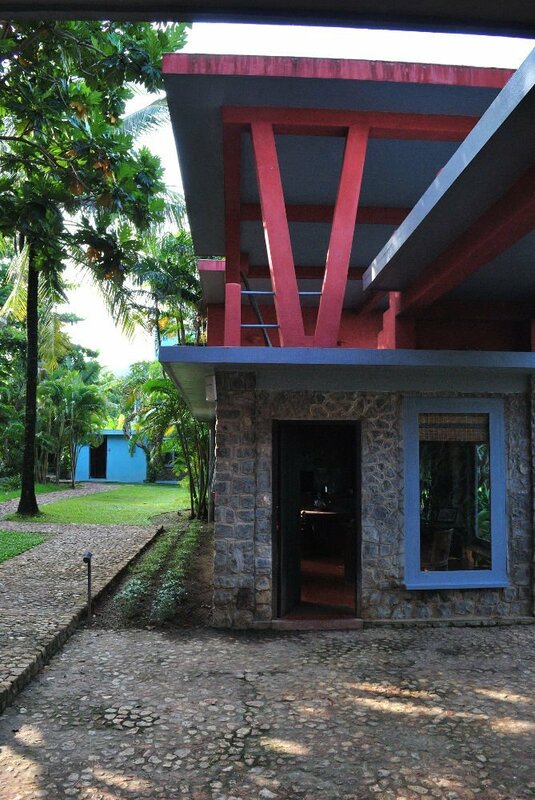 The villas are adorned with local antiques and artifacts, and each pops with a pastel layer of natural pigment on the exterior. The rooms vary in size but all offer a sense of harmony, comfort and well-being, with many enjoying a tranquil view of the sea. Jeff’s vision for the staff is that of a social unit, providing on-site lodging and high quality facilities in addition to meaningful employment. (Coincidentally, a manager at The Balé had previously worked at Knai Bang Chatt: full of praise for his former employer, his reasons for moving were family related). Sustainability Manager Ehren Garner gave us a detailed tour of the environmental projects, ambitious in their all-encompassing aims. In addition to recycling, items are upcycled (such as the evian bottles turned into glassware), where it makes sense for the resort or commerce. In the near future, the plan is to source biodegradeable room ammenities, and provide them on request rather than by default. An ever-growing proportion of produce is grown here at the organic farm. This is a sophisticated, data-driven operation that seeks to optimise every stage of the process – from vermiculture to soil composition, to horiculture – for maximum ouput. Knai Bang Chatt’s third prong is education and outreach across Kep, for both its own sustainability goals and to promote social mobility. These are just a few of the initiatives that Knai Bang Chatt has embraced and that other establishments, we hope, will emulate. 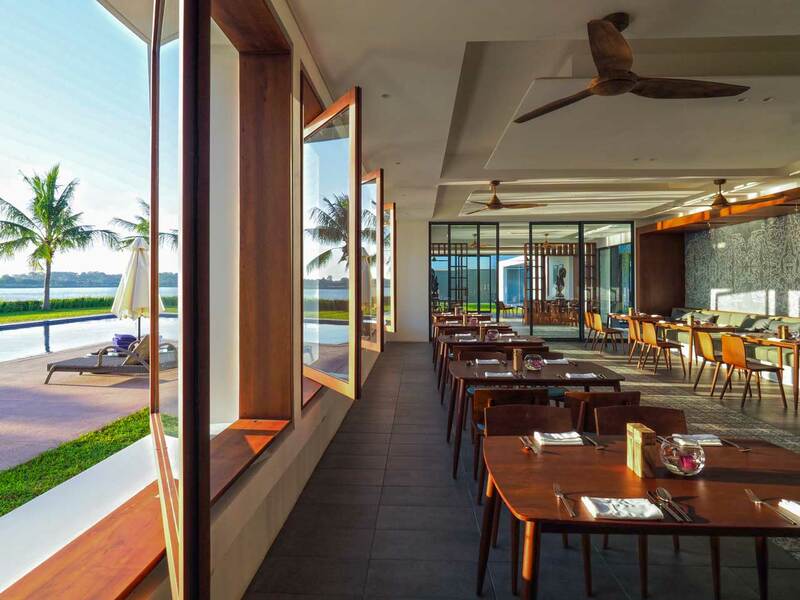 Selfishly, one of the more apparent benefits is Knai Bang Chatt’s superlative gastronomy. With the seas at its fingertips, there is an abundance of (responsibly-sourced) fish on the menu, prepared in both local and Western styles. 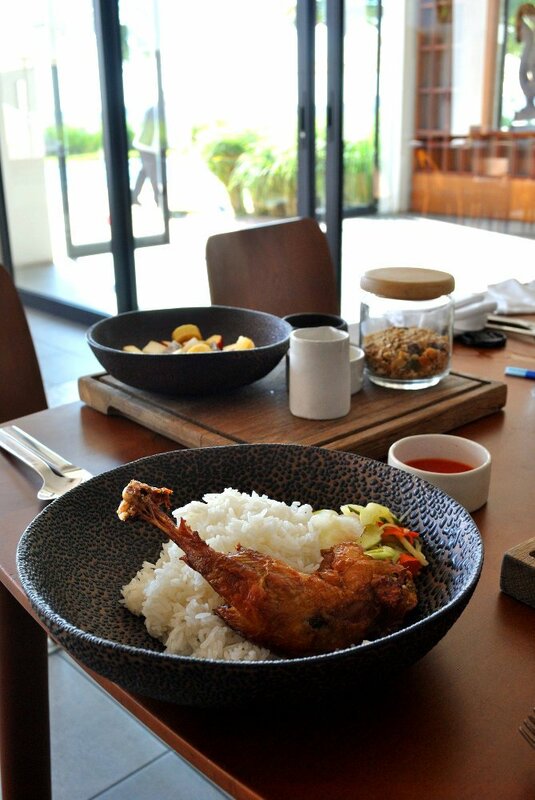 Breakfast, too, is an opulent affair, with a mix of home comforts and exotic Asian choices to tantalize your taste buds. For the run up to Christmas Day, where else would we have gone but Siem Reap to see Angkor Wat? The city itself is unremarkable, save that it is highly diffused and, save for the old city centre around the river, appears suburban. Evening is the best time to visit the city centre, and most bars, cafes and even shops stay open fairly late. Unfortunately, the old town north of the river has established a clubbing culture and continuously emits nauseatingly loud bass and electronic beats. Choked with people and noise, these parts were no-go zones for us. Yet away from the night clubs there are plenty of chic bars, boutiques and artists’ workshops, effecting a genteel and relaxed vibe. It was a curious, but welcome surprise to find a good selection of high quality, authentic Italian gelatos scattered around, perfect for the still warm weather. Shopping was the last thing on our minds, but of course there is a thriving trade around Siem Reap’s cultural icon. Indeed, this is the primary destination for artisanal and authentic Cambodian crafts – perhaps too much so. Arstisans Angkor is feted both for its high quality, hand made products and as the most successful example of Cambodian social enterprise. Although it has outlets across the country (even in the airport), their workshops are located comfortably within the city limits. It may be worth a visit just to see the manufacturing process, fully open to visitors, which itself draws tourists by the busload. There are smaller outfits which purport to ape Artisans Angkor, but there seems to be little regulation of this particular industry. One storefront suggested to us had a gaggle of ‘weavers’ idling around a solitary, conspicuously empty loom when we visited. Either way, anyone expecting to trade with beads will be sorely disappointed. The genuine operations are owned or operated by Westerners, and there is enough demand to fuel high prices. Only the Old Market, in the centre of town, offers the usual merchandise at afforable and bargainable prices. Instead, we would like to recommend Sombai, unique for their artisanal rice wine liquers. We happened upon their stall, one evening, just inside the entrance to King’s Road Siem Reap (yes, really). They offer an exciting variety of flavours, and offer generous samples. A pleasant experience in itself, the liquers themselves are a somewhat acquired taste. We couldn’t resist a visit to Siem Reap’s straightforwardly named Bugs Cafe. Run by a French expat, the tapas and cocktail bar promotes the use of insects for fine dining cuisine. The various sharing platters feature all their bugs, creatively and singularly prepared – if completely unorthodox for the Western dinner menu. I doubt ant muffins and cricket kebabs will become a common restaurant sight anytime soon, no matter how tasty. 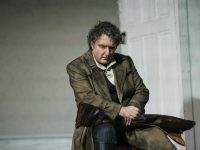 There are also several exotic meats like crocodile and snake on offer, prepared more familiarly, as a compromise between the outlandish and domestic. As for the bugs themselves? We unanimously agreed that scorpion is disappointing, its crunchy shell encasing a bitter morsel of flesh. The various ants were flavourful, especially inside batter. Most of us enjoyed the crickets: both the smaller, which resembled crispy shrimp; and the larger, nuttier ones. These, and my personal favourite – the rich, buttery silkworm larvae – are bugs I would seriously consider adding to my diet. The Bug Mac, a mixed bug patty and cheese slider, was utterly divisive (sample size of two). If one can forgive the mealy texture it has a wonderful, mouth melting flavour faintly resembling foie gras. If you still remain unsold on the food, it is still worth a visit for the excellent and imaginative cocktail menu – mostly bug free. On a grateful note, the service was friendly, professional, and went above and beyond the Cambodia standard. Just after we arrived, a colleague realised that they had mislaid their phone en route. Having only just sat us down, the cafe team immediately organised a (successful) rescue mission, which involved an excursion to ransom the phone from a gang of youths. Stay tuned for our next travelogue, where we go through our final three days spent exploring Siem Reap’s vast temple sites. Just kidding. We probably could write a couple thousand more words on that subject. But truly, more so than anywhere else in Cambodia, the magic is in the discovery and personal revelation. The temples are Cambodia’s star attractions, and the environs are the best tended, and prettiest, in all the country. The driveway to the temples is line on both sides by forest, and unblemished by either trash or dust. On our return trips, in the golden glow of dusk, we saw plenty of families and couples picknicking around the large ponds that were dotted around. The grounds themselves are a pleasure to walk and explore, even in the uncompromising heat – although there is direct car access to most of the larger temples. Angkor Wat is one of the largest temples by footprint, the tallest and one of the most impressively decorated. It truly is wondrous, attracting tourists and worshippers alike, and really requires at least an entire day (if not more) to appreciate in all its ancient glory. Bayon is rarely mentioned by name in Western media, yet may be very familiar for the spires adorned with massive human faces on each side. This is another temple that one could spend a whole day exploring, not least because there is very little guidance on the sequence of the highly detailed carvings. Even Lonely Planet’s guide confounded us. The stone galleries depict a massive invasion of Siem Reap, by land and river, interspersed with depictions of court rituals, hunting and life at court. Baphuon is massive and squat, more citadel than temple. Along the eastern wall, you can make out the remains of a colossal, reclining Buddha that would have comprised the entire length of the ground level. Ta Prohm is the so-called ‘Lara Croft’ temple for its depiction in the Angelina Jolie film of the same name. 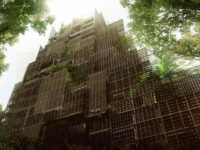 Long ago, French archaeologists decided that the temple would be left in the overgrown state they orignally found it. Today there is a programme of stabilisation, and the vegetation tamed along visitor pathways, but otherwise it continues to (very slowly) decay. A wildly different, if somewhat mournful, place to fit in between other temples. Banteay Srei is a long way from the rest of the temples – it took us over an hour to get here on an asthmatic tuk tuk – but the trip is well worth the visual feast here. This is a small site, entirely ground level, but nearly every facet is covered in detailed, multi-dimensional carvings that surpass everything else we saw in their complexity and intricacy. Even further to the north Kbal Spean is an intriguing group of rock carvings, carved along and within a flowing river high up in the hills. Simple in comparison to the temples, this is still worth a visit if you’re physically fit enough to negotiate the steep and uneven nature trail. Many thanks to The Balé, La Rose Suites and Knai Bang Chatt.